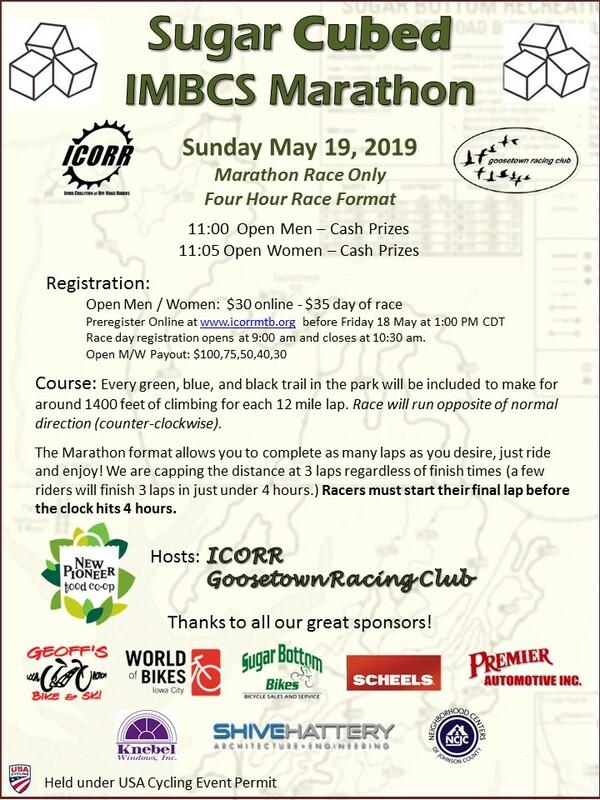 Get ready for the Sugar Cubed Marathon, the second of five 2019 IMBCS Marathon Events. This separate Marathon-Only event allows Marathon Riders to experience everything that Sugar Bottom has to offer – 12 miles of classic Iowa singletrack, 1400’ elevation gain – three times. S3: Sugar, Cubed. This year we’ll be running the race in the opposite direction, counter-clockwise (“backwards” to normal trail markings). Laps will be capped at a maximum of 3 laps, and racers must start their third lap before the clock hits the 4 hour mark. Racers will be scored for completing 1 through 3 laps. Along with the Open Mens and Womens IMBCS Categories, we will again recognize the intrepid Single Speed riders. We’ll score SS with the main field, but there will be some special awards for the top three SS riders in the field. Pre-registration available at USA Cycling.